Hilde Kate Lysiak is going to be a major force in journalism some day. A certain beat reporter who publishes a community newspaper, The Orange Street News, in Selinsgrove has had the Internet quite abuzz of late. We’re pretty impressed by her too. Hilde Kate Lysiak, 9, isn’t into tea parties and playing with dolls, as some of her critics suggest she ought to be. Rather, she attends local government meetings, dashes out on her bicycle to cover breaking news and reports on crime — with or without the local police department’s cooperation. Hilde doesn’t suffer her detractors gladly. And she has learned at a tender age how harsh those haters can be when they are responding viscerally to news that makes them uncomfortable. Welcome to journalism, Hilde. You are now — for better or worse — a member of the “media.” Godspeed. Hilde made news herself this week when she posted a video telling her critics exactly what she thought of those “mean messages” that poured in after she scooped another local paper by covering a grisly murder. Hilde was the only reporter who showed up at the murder scene. She got the tip because she was at the local cop shop chatting up the chief about some vandals who had recently been caught when he told her he had to go — he was working on a big case. So she followed him. And beat the other paper by a day or so on the story. 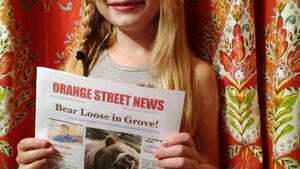 Is this 8-year-old's newspaper better than yours? The website Jezebel gave Hilde a sage piece of advice many digital-age journalists before her have followed: Never read the comments. Kudos to Hilde’s parents (her father is a former New York City reporter who took her on assignment, which is where she apparently caught the reporting bug) for allowing her the freedom to navigate the typically safe town of Selinsgrove (population about 5,300) and build relationships with community sources. Hilde is going to be a major force in journalism some day. We’d bet her future Pulitzer on it. This brings to mind another star investigative reporter named Hilde — Hildy Johnson, the fictional character played by Rosalind Russell in the 1940 comedy about a New York City newsroom and its wacky inhabitants, “His Girl Friday.” Apparently, Hilde Lysiak is a fan of the fictional Hildy Johnson and keeps a “His Girl Friday” movie poster on her wall. These two tenacious reporters named Hilde/Hildy, though more than a generation apart, share a quality that stands all good reporters in good stead: moxie. As card-carrying members of an industry that has been working as hard as it possibly can to survive while listening to the steady drone of its premature death knell for more than two decades, we can’t help but smile when we see the future of journalism — and it looks like third-grader Hilde Kate Johnson, of Selinsgrove, Pennsylvania.